Dortmund - It was the emotional occasion everybody had expected at the Signal Iduna Park, as Borussia Dortmund gave departing coach Jürgen Klopp the perfect send-off with a 3-2 win that ensures BVB will play in the UEFA Europa League next season. Shinji Kagawa: "I had the feeling as early as the first half that our movement and enjoyment of playing - the things that mark us out - were back again. I really felt our team spirit today and we played really well. The scenes at the end were obviously very emotional, but now we want to win the [DFB] Cup next week and give Jürgen Klopp and Sebastian Kehl a great send-off and celebrate on Borsigplatz again. It was just sensational when we did it in 2012." Erik Durm: "After the game it was very emotional. The coach has always given everything for this club and for us, and we've always tried to pay him back. The pictures at the final whistle were very emotional and they really got to me. We're really happy to have won and to have given the coach a worthy send-off. We've got one more game now and we want to win it, for the coach, the club and for ourselves." Henrikh Mkhitaryan: "We played really well today, which we wanted to do, especially for Sebastian Kehl and Jürgen Klopp. There was a period during the season when I didn't play well, but I always believed in myself and worked hard, and that's paying off now. I thank my team-mates and coach for always believing in me too and I hope things continue to get better in the future." 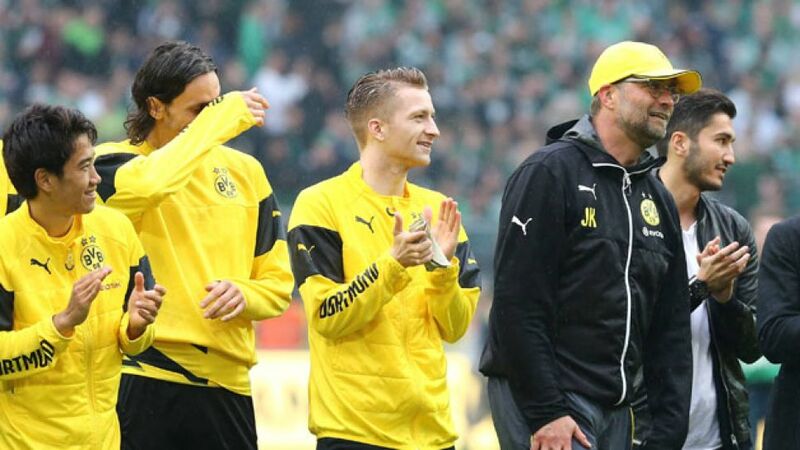 Sebastian Kehl: "It was a really emotional day. I'm happy and very grateful for the time I've spent at Borussia Dortmund. They've been 13 years of ups and downs, but it's hard to find the words for what I'm feeling now. I'm happy to have won today, on one hand because this great club is now in Europe next season, but also for me to end my Bundesliga career on a winning note, even if we have a very important game next week. I'll definitely never forget the moment today, though." Theodor Gebre Selassie: "After the goal from [Levin] Öztunali, we were back in the game, but we switched off for a few set-pieces and the counter-attack that led to their third goal was tough to take. At half-time we said we'd give it everything and we managed to get a goal back. It was just too late." "Dortmund were good in the first half and they dominated us. We wanted to give it everything we had today and we had the chance to take something, but we couldn't get the goal we needed." Zlatko Junuzovic: "We're obviously disappointed - nobody likes to lose. We came up against good opposition in a great stadium with a phenomenal atmosphere. I think we can hold our heads up high higher after the season we've had."